A photo released by the Cook County State's Attorney's Office shows Chicago Police Officer Jason Van Dyke, who was charged Tuesday with first degree murder in the killing of 17-year-old Laquan McDonald. 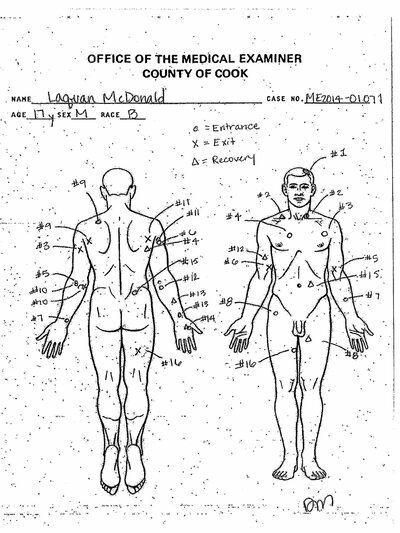 More than a year after prosecutors say Officer Jason Van Dyke shot and killed Laquan McDonald, 17, a first-degree murder charge has been filed against the officer. 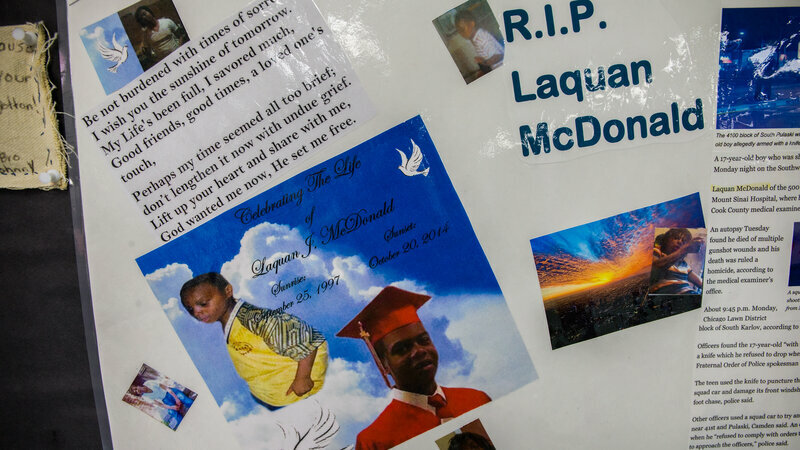 McDonald was shot 16 times in October of 2014. Police say he had refused to follow officers&apos; instructions as he walked down a street with a knife, and that he had punctured several cars&apos; tires.An attorney for McDonald&apos;s family says he had his back to the officers when he was shot. "Van Dyke turned himself into authorities this morning and is scheduled to appear in bond court today at noon," according to a statement from the office of Cook County State&apos;s Attorney Anita Alvarez. We&apos;ll update this post with news from the bond hearing and a news conference by Alvarez this afternoon. The Chicago Tribune says it&apos;s the first time one of the city&apos;s officers "has been charged with first-degree murder for an on-duty fatality in nearly 35 years." The announcement comes as many in Chicago have been anxiously awaiting the court-ordered release of a dash-cam video of the shooting, worried that it could spark unrest in the city. Ahead of tomorrow&apos;s deadline for the footage to be released, Mayor Rahm Emanuel and other community leaders have been calling for calm, while activists are planning protests – including one demonstration that would block a major commercial street on Black Friday. Rauner said Tuesday his office has been briefed on the contents of the video that shows 17-year-old Laquan McDonald&apos;s death in 2014. Rauner says the video is "very troubling" and that he expects public reaction to be "strong." But he says he hopes and believes the response will be "thoughtful and peaceful." The Republican declined to say whether he&apos;s deployed additional troopers to Chicago or put the Illinois National Guard on standby. "Officer Jason Van Dyke, who is white, shot McDonald 16 times. He arrived at the scene after other officers had been following the African-American teen as he walked the streets carrying a knife and refusing to follow orders. An autopsy report showed that the hallucinogenic drug PCP was found in McDonald&apos;s system, according to the Associated Press. Van Dyke&apos;s attorney says the officer feared for his life." WBEZ adds that Van Dyke, 37, who was put on administrative duty after the shooting, had not received voluntary crisis intervention training, which focuses on options other than force to resolve conflicts. In April, Chicago&apos;s City Council approved a $5 million settlement with McDonald&apos;s family, which had not filed a lawsuit. Emanuel says he hasn&apos;t seen the video — but as he called for calm, he also said that from what he has learned about the case, "What happened here is wrong. There is no justification and it&apos;s profoundly hideous, in my view." The Chicago Sun-Times recently filled in some of the details about McDonald&apos;s life, relaying the story of a young boy who was twice taken out of his mother&apos;s care due to abuse allegations. The newspaper reports that he was a ward of the state when he was killed, and adds that "McDonald was particularly close to his grandmother, Goldie Hunter, and was in her care until she died last year. His daily life seemed to unravel after her death."